VERSAILLES — One of Kentucky early distillers, Oscar Pepper, is making history again, this time about what early farm life was like in the Bluegrass. Brown-Forman owns the Woodford Reserve Distillery near Versailles, on the site of the original Pepper distillery. 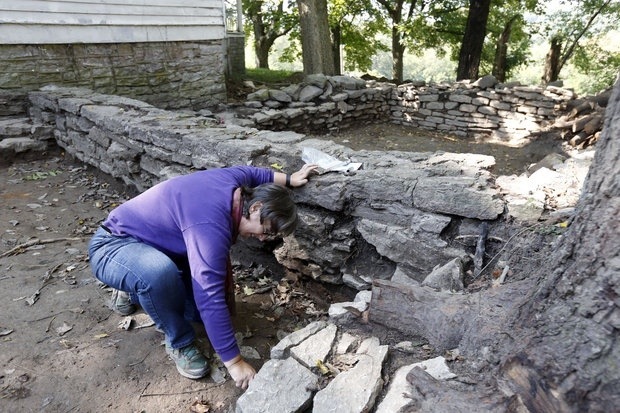 Late this summer, archaeologists began excavating around the 1812 log cabin built by Elijah Pepper on a hill above Glenn’s Creek, where the first distillery and grist mill were built. 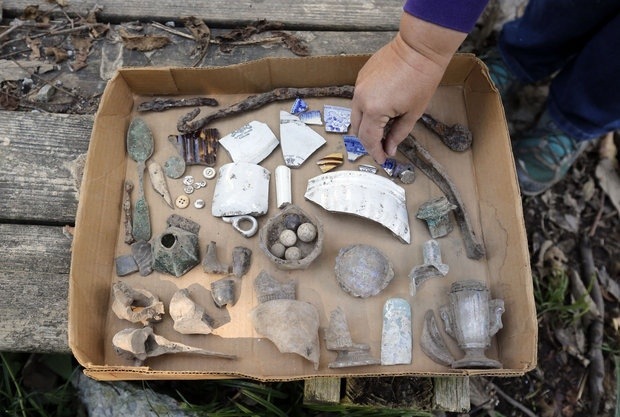 “We hoped to find any artifacts or architectural remains that would help fill in the picture of life there at the Pepper house,” said Dr. Kim McBride, co-director of the Kentucky Archaeological Survey, which is a partnership between the University of Kentucky Department of Anthropology and the Kentucky Heritage Council. McBride and the other archaeologists located an area just to the side of the house, which is still standing, that proved a surprisingly rich source of one of archaeology’s best resources: trash. Elijah Pepper’s son, Oscar, and Scotsman James Crow in the 1830s revolutionized the bourbon industry by using scientific and hygienic practices and writing down their processes, said Chris Morris, present day master distiller at Woodford Reserve. “Oscar Pepper was born in that house, as were so many other Peppers, and James Christopher Crow probably ate dinner in that house, slept in that house,” Morris said. “This was probably a combination kitchen and slave quarters,” McBride said, which were common in that era. Records indicated the Peppers had six slaves when they settled in Woodford County and acquired more. “After 1865, we have the death of Oscar Pepper and the estate is in transition, and with emancipation the structure was probably no longer needed,” McBride said. Morris’ dream is to display the artifacts, possibly in the distillery’s popular visitors’ center. He also would love to use the stone foundation and the cabin in some way, possibly in another public distillery space. With bourbon again on the rise, the Woodford distillery is expanding and Brown-Forman will be building several new barrel warehouses, including one very close to where the house is. They haven’t determined whether the cabin will be moved. “We’re still working on plans for what we’re going to do with the house,” Morris said. And the archaeologists aren’t done: Morris said they will be coming back to dig around the original distillery and grist mill site along the creek. “I can’t wait to see what they find there,” Morris said.